Howard Freeman, eager as a rodent who gnaws at wood. It started off as I was cruising Craigslist for jobs, gigs or whatever I can do to make some money. I generally stick with art or design related searches. Then I saw a request for caricature artists, a little vague as to the details, but it couldn’t hurt to submit myself. This was done reluctantly based on the fact that i haven’t drawn caricatures in any professional capacity in over 13 years! Even then it was pseudo professional – a couple of gigs working all-night graduation parties and a benefit for a cancer support group. Each of these jobs were done with a pad of paper and a single sharpie, no color, no shading, just simple line drawings. My experience drawing caricatures had been limited to funny pictures of teachers, professors and school mates while “taking notes” in class throughout high school and college. I often caught the attention of fellow classmates who saw me drawing a caricature. Along with the occasional, “that’s funny, dude!”, I’ve actually been offered money for the finished drawing. “Howard I like your work and your site. But can you do caricature sketches quickly? This is a live convention where you would be sketching people who came to our booth, one of the largest at CES, you won’t have a dull moment” She then requested a few examples. One of the largest booths at CES? CES, the Colossal Electronics Show, er, Consumer Electronics Show? The international show with 140,000 attendees expected? No pressure, huh? Could I pump these out fast? Well, I immediately whipped out a pad of paper and a sharpie. I drew a quick Obama, Howard Stern, and some faces of people I found on the internet. I practiced like a madman. The Good News! Wait, what…? 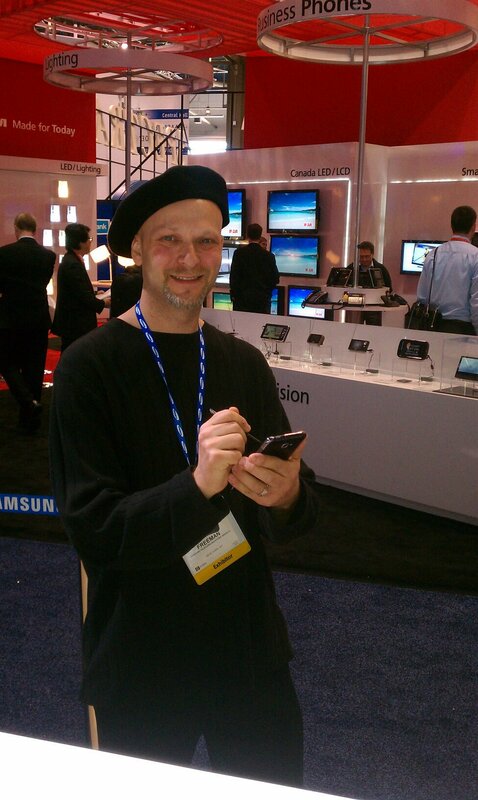 Howard Freeman doodles a caricature on the Samsung Galaxy Note at CES 2012. Also they revealed the client, SAMSUNG! The company that beat the iPhone in sales last quarter! I was then informed that I’d be drawing on their new Samsung Galaxy Note, which has a stylus pen to draw right on the screen. This phone/tablet was the big announcement from Samsung at CES and highly anticipated! Wow, amazing news! From my simple line drawings, they must’ve seen some potential in me. I wanted to practice, so I immediately whipped out my HTC Evo and downloaded a drawing app, the best rated one. I tried for a while to get something done with my finger, but it looked horrible! Either the screen was too small or my finger was too fat. I didn’t know anyone with an iPad or other tablet that I could borrow quickly. Then I waited. And waited. Almost 2 full weeks! Granted these were the last weeks of the year when everything slows down, but it was only a week or so before the big show! I was very nervous. On January 2nd, I got the confirmation! I was a go for CES!!! Holy crap, I think I literally jumped for joy! I arrived as eager as a rodent who gnaws at wood (I feel dirty saying its name). I met the corporate trainer and the other artist. We were told that we were to wear berets on the job to convey a Parisian street artist look, hmm, OK. Frankly I’d wear a clown suit if they asked me, I was just happy to be there! They also informed us that there were 12 other artists doing what we were doing, then proceeded to explain that we were the focal point of the main attraction of the Samsung line-up! The other artists would be working in the hallway, while the two of us would be on the main floor of their “booth” (which is actually an enclosed, GIGANTIC room with hundreds of Samsung executive employees and trainers!). There was a definite learning curve going from a sharpie on paper to a small tablet/phone device. Fortunately, they let us take home the device to practice. Phew! After drawing my wife, my kid, any face I could find, I finally hit my stride! The Galaxy Note, turns out is truly amazing! It’s intuitive, comfortable to hold, and became an extension of my hands. All of a sudden I had my new medium of choice! So there we were, all eyes on us. With half confidence/half terror, I took my first “victim”. I told him, “You’re either gonna love this or kill me.” This guy looked like a combination of Neil Patrick Harris and David Hyde Pierce. Very strong features, which is good for a caricature. I whipped up a funny, colorful drawing that actually looked like him! My terror was turning into full-on confidence. 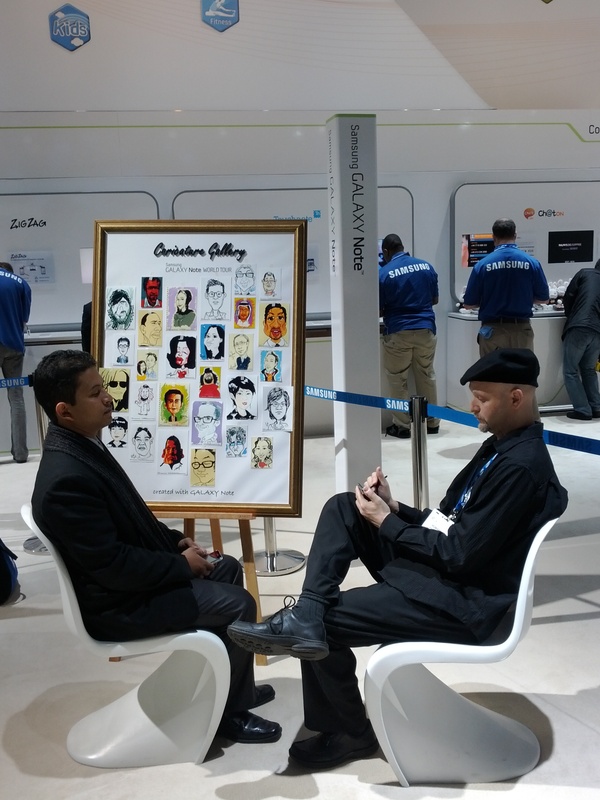 Click to see more of Howard's caricatures from CES 2012. As the days went on I got better, and what was taking nearly a half-hour, I cut to half the time. By the end I was an animal! And nobody killed me, which is good. As I worked, several cameras were aimed at me almost constantly, some small phone cameras, some huge, newsroom style ones. I tuned them all out. When a news crew came by to do a story, I just focused on the job. It’s when I got home and googled the correct keywords, I got an eyeful of my colleagues and me! A bunch of videos and pics of me drawing people! I was on FOX Business channel and countless other news stories and blogs, (like this one), and many of which I’ll probably never see. I am also immortalized on Getty Images. Now people can purchase stock photos of me. Pretty cool. One guy actually filmed me drawing an entire caricature and sped it up to just under 4 minutes and posted it on youtube (see video at top of post)! Very cool! Over a hundred caricatures done in just 4 days. You’d think my hand would hurt. Nope! Which is a huge testament for the Galaxy Note. No cramping, no calluses, no way! No discomfort at all. I was tired, but on such a high from the whole whirlwind experience, I felt like I was floating. I couldn’t complain, why would I? This was my dream gig. I’ve done many styles of art from small cartoons to huge murals, drawing caricatures is the easiest, most fun medium I’ve done. The Samsung Galaxy Note makes it even easier, no messy markers or charcoal, and it’s instant gratification from the customer. And now I know my true calling.